The Food and Drug Administration cleared for sale in the U.S. a new version of a tiny camera in a capsule, made by Given Imaging Ltd. in Yoqneam, Israel, and swallowed by patients to diagnose gastrointestinal (GI) conditions. 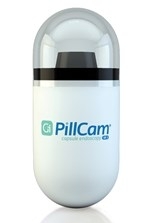 The company expects its PillCam SB3 to be available in the U.S. in the last quarter of 2013. The PillCam SB3 contains an imaging device and light source that visualizes tissue in the small intestine, to help diagnose GI disorders in patients age 2 and older. The device measures 11 by 26 millimeters (0.43 by 1.02 inches) and weighs less than 4 grams. Given Imaging says PillCams in all versions have been used more than 2 million times worldwide. The SB3 version of PillCam can record images at a rate between 2 and 6 images a second that adapts to the speed of the device as it passes through the intestine, providing a more complete picture of intestinal tissue for physicians. Earlier versions of PillCam recorded images at a fixed rate. In addition, says the company, the system provides a 30 percent improvement in image resolution, as well as smarter algorithms that improve its efficiency in compiling video. The company says FDA cleared the new release of PillCam to detect Crohn’s disease, iron deficiency anemia, and obscure GI bleeding. Crohn’s disease is a type of chronic inflammatory bowel disease that causes inflammation of the digestive tract lining, and can lead to severe diarrhea, abdominal pain, and malnutrition. Iron deficiency anemia is results from insufficient iron in the blood, but can be caused by slow, chronic intestinal bleeding. Obscure GI bleeding is persistent or recurrent bleeding in the gastrointestinal tract. FDA provides pre-market clearance for medical devices to be marketed in the U.S. under section 510(k) of the Food, Drug and Cosmetic Act, and thus the actions are known as 510(k) clearances. These clearances are required when a new device is introduced or an existing device undergoes significant design or feature change.